Image caption Northamptonshire Police said Jason Farquhar had "abused his position"
A former police officer who made "unwanted" approaches to vulnerable women has admitted six charges of misconduct in a public office. 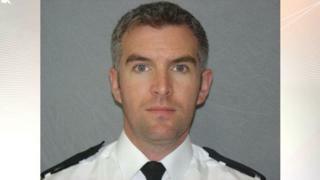 Ex-Northamptonshire Police PC Jason Farquhar also sent explicit photos of himself to a female colleague, a court heard. Farquhar, 44, of Stamford, is due to be sentenced at Northampton Crown Court on Tuesday. Deputy Chief Constable Rachel Swann said he had "abused his position". The force said he was only able to make contact with five of the women because he was a police officer. Some of the women originally came into contact with Farquhar when he was investigating allegations of domestic abuse. Police investigators said a two-year inquiry found examples of contact by phone, text or social media, but none of the cases had developed into a sexual relationship. After Farquhar admitted the charges on Monday, Ms Swann said: "These were vulnerable women who were coming for help and instead he abused his position and started to make unwanted contact. "It's dreadful behaviour, but we should reiterate, especially to women, that they should have confidence in us and if they report these crimes, they will be taken seriously." Farquhar, who was based in Oundle, also admitted a further offence under the Computer Misuse Act. The force said he was dismissed a year ago following a misconduct hearing.